How Honest is the Story You Tell? What is your narrative? What story do you tell to explain who you are and what your life has been like? 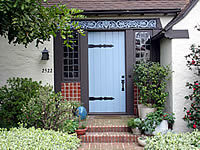 If we’re given a choice, the style of door we select and the color we paint it says a lot about us. A house with a glass door without shades or curtains presents the owners as people who aren’t afraid to show others what the inside of their house looks like. I think this particular house is more welcoming than a house where a solid door stands between windows where all the curtains are drawn. Of course, since it is the door to my house, I am not an impartial judge. In any case, we can only guess what lies behind most closed doors, for a closed door primarily symbolizes our right to determine who will be allowed to enter and who is excluded from our personal, physical space—as well as being an attempt to keep out mosquitoes in the summer and cold in the winter. Similarly, the clothes we choose to wear once we leave our house, assuming we aren’t clothed in our birthday suit (which would certainly speak volumes), offer clues as to how we want others to see us. Further, when we interact with other people, we automatically expose some of our thoughts and emotions, although we may try to keep as much of that inner space protected as possible. Even if we don’t say anything, we’re sending a message. When we do talk, what we say and how we say it can open a door to our true selves or hide some part of who we are that we don’t want others to see. In the words and gestures we use to tell it, every story we tell expresses a purpose, or at least tries to. One story is meant to let others know that we are a victim. Another story shows how smart and accomplished we are. We fudge the truth because we’re afraid others will not like us, will not think we are as smart as we want them to believe we are, will not give us the benefit of the doubt we give our own actions, and so forth. I am not suggesting that you have to be totally honest and open about every aspect of your life with every person you meet. There are legitimate reasons to hold back some parts of you from the scrutiny of others. It is important, however, if you are to understand yourself, that you pay attention to what you want others to know about you—and whether or not you are willing to be open and honest in your stories. Virginia Woolf once said that, “If you do not tell the truth about yourself, you cannot tell it about other people.” I might paraphrase it a little to say, if you can’t tell an honest story about yourself, you aren’t likely to recognize truth in the stories of others. If someone at a social event asks you who you are, what is your answer? If you tell someone about your life, what do you choose to tell, and what is it about you that you want to promote by responding that way? When you next tell a story about yourself, will you pay attention to the effect you want that story to have on your listeners — and notice how truthful you are?